I want to focus on improving my speaking skill more, especially situation of traveling and meeting new friends. Because I have only 2 weeks more. Last week I consulted with each teacher about my problems of studying English, and they changed as I said. (Thanks so much!) However we past 1 more week and I think I should change a style to lean English again. So I wrote a letter about my requests how to take a lesson and why I think so. Originally, I want to learn English enough to speak in my travel first. To achieve it, I thought I should fix these issues. This is the basic premise Please tell me if you are aware of a big issue than I think. My English is unfortunately just Japanese pronunciation. I am very happy when my teachers understand my English in our class, but on the other hand a lot of Filipino who are taxi drivers, shop stuffs, restaurant stuffs and something like that could not understand my English many times because of my pronunciation. It is not every time but often. 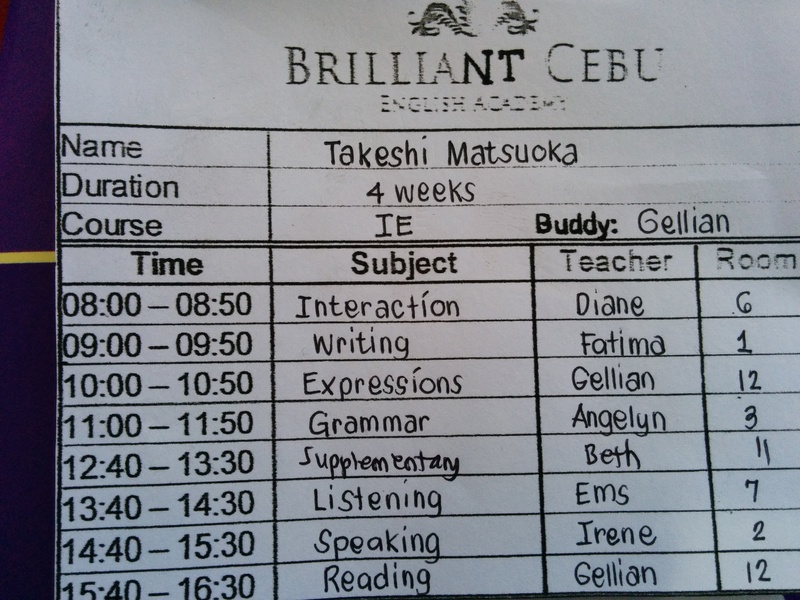 I guess you are used to listen our Japanese English that’s why you can understand easily then other Filipino. That is special thing so I want to say, “I appreciate you” in every lesson. In a future I will talk with normal people so I should have to modify my pronunciations as enough to foreign people understood. Every time when we talk something. I get a frustration that I can not make a sentence quickly. Especially I am not good at making interrogative sentences. Next, expanding my vocabulary is very important, not only for my speaking but also for listening. I guess my listening skill is not but. I can listen clear English as long as teachers use easy vocabulary. However I didn’t make sense even though they use basic words such as “consider”, “indeed” and “instead”. It’s my serious problem. I listed three issues, but they are not same priority. First I guess good pronunciation is most important. Because if foreigners can’t understand what I say, I can’t tell them anything even though I speak correct English and use difficult words. Next, it is second important to make sentence quickly. Finally, expanding my vocabulary is third, since I can study minimum vocabulary for myself. I should set a priority higher that I could study only here.  Please don’t use complicated vocabulary, and focus on words for travelling.  Consciously let me make interrogative sentences. Focus on common travel expressions. I want to change materials to news or travel something. For example announce of how to swim with whale sharks, tour conductors announce, broadcast site associated with the fire and something like that. Focus on pronunciation. I will speak more loudly and slowly when I read long article so please correct my pronunciation. In addition I want to use materials about travel as written previously. I want to try IELT speaking questions because One of my friends who is manager of teacher in native country recommended me when I consulted her for my situation. I would extend my skill of making sentence quickly. I guess writing is not necessary to travel conversation, too. So I also want to change like grammar’s request. If I have two months to study English more, I would study grammar and improve my writing skill. I think teaching ESL style is very good for people to learn for long-term but I have no time and I need to speak English immediately.